An introduction to the exciting, challenging and fun world of improvisation! Forget class clowns and stand-up sweats – at the Bristol Improv Theatre we don't care who's funny. For us, improv is about going with the flow, celebrating the screw-up and connecting with amazing new people. For the last four years we've taught our students how to be more spontaneous, creative and confident – both on stage and off. EVERYONE! Even if you have absolutely no improv or performing experience! People seeking to increase their confidence, creativity or spontaneity. Actors looking for new approaches to their work. People looking to find new friends and meet new people in Bristol. Performers of all kinds who want to tap into the Bristol theatre and arts scene. A programme designed for actors, performers, and those interested in getting on stage! This programme is actually a programme of 4 separate courses: Great Scenework, Creating Characters, Storytelling and Improvised Singing. Each course covers a key aspect of performance, and each culminates with a showcase to apply what you have learnt. These 7 week evening courses will run throughout the year. They can be completed in any order, or taken individually. The aim of completing the programme is to give students a full set of skills for performing improv. The stage is calling! Anyone who has completed the Discovering Improv course and wants to learn more! Actors who want to hone their skills. Performers of all kinds who want to explore spontaneity. 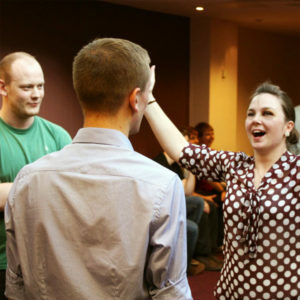 Delve deeper into the world of improv… more skills, more play, more gems! This is where you'll find the next step for your improvisation journey – from one off intensives by visiting improvisers (both national and international) to specialised courses our BIT instructors have distilled from their years of performing and coaching experience, and even cross-disciplinary courses by practitioners who are bringing lessons from their art form to improv (and vice versa). It has been said that there are as many ways of practising improvisation as there are improvisers. And at the BIT we'd add that you can learn something different and valuable from every single one. Who are these course for? Each course will have its own specific requirements – please see the individual listings. Got any questions that aren't answered here? Then contact us and we'll be happy to answer them.